Iceland has sent four former directors of its bank Kaupthing to prison for fraud. But the chances of similar legal action happening in the UK are low, where fraud investigators have a poor record. The Serious Fraud Office (SFO) is the main agency for investigating and prosecuting major fraud. It was formed in 1988 after a spate of high-profile cases. A government-sponsored inquiry into share price rigging at Guinness in the 1980s concluded that too many executives at major corporations had a “cynical disregard of laws and regulations … cavalier misuse of company monies … contempt for truth and common honesty. All these in a part of the City which was thought respectable”. But rather than changing corporate laws, amending personal liability of directors, or creating an effective enforcement agency, the government created the SFO. Last week, the SFO’s case against businessman Victor Dahdaleh collapsed because at the last minute it could not provide evidence of alleged graft. This is not the only case the SFO has botched. It spent between £25-40m investigating price-fixing by pharmaceutical companies supplying the UK’s National Health Service (NHS), but the case collapsed because of errors in the interpretation of law. Previously, the SFO was very slow in taking action against BAE Systems over allegations of corrupt practice. The SFO mislaid 32,000 documents relating to the case. It is currently facing a lawsuit for damages from the Tchenguiz brothers after dropping a three-year investigation into the collapse of Icelandic bank Kaupthing. In 2012-13, the SFO brought 12 cases covering 20 individuals, eventually securing 14 convictions and recovering £11.4m from fraudsters. But it rarely went after the bigger beasts. 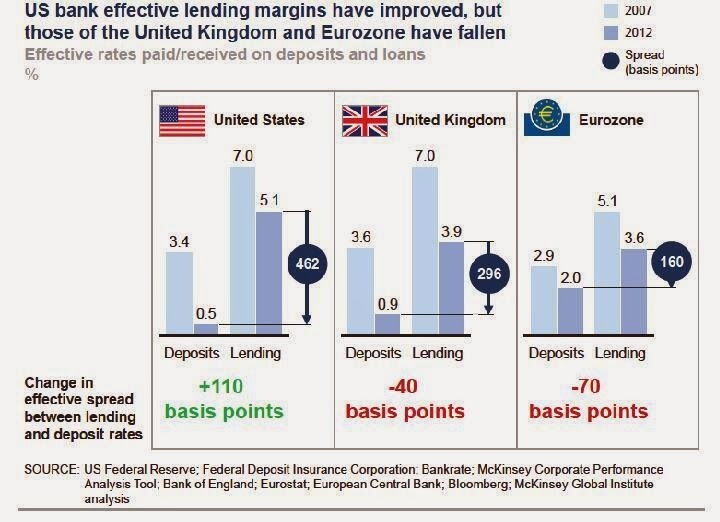 Money laundering and sanctions busting by British banks did not appear on its radar. The SFO has hardly been visible in investigating and prosecuting the misdemeanours of bankers who brought the UK economy close to collapse. In mitigation, it might be argued that the SFO’s failures are the outcome of the politics of government cuts. In 2008-09, the SFO had an investigations and prosecutions budget of £52m. Despite the banking crash, LIBOR rigging and other scandals, the UK government has drastically reduced SFO’s resources. For 2013-14 its budget is £30m and will decline to £28.8 million for 2014-15. That is a cut of over 44% since the start of the global financial crisis. Faced with a reduced budget and pay freezes, the SFO has been losing experienced staff and outsourcing a lot of its legal work, often paying very high fees. Such practices make it difficult to build in-house expertise and an institutional memory. Other countries seem to assign higher priority to fraud investigation. The US equivalent, the Securities and Exchange Commission (SEC), has an annual budget of US$1.674 billion (about £1.1 billion). It is therefore in a far stronger position to take on the bigger beasts. The SEC has its shortcomings, but it is more likely to get a result than the SFO. The SFO’s failures are indicative of Britain’s failure to build durable and effective institutional structures to fight financial crime. Rather than a single powerful and well resourced agency, there is an ineffective patchwork of institutions. These include the Financial Conduct Authority (FCA), the Office of Fair Trading (OFT), The National Crime Agency (NCA) Her Majesty’s Revenue and Customs (HMRC), the Crown Prosecution Service, the London Stock Exchange and the Financial Reporting Council, to name just a few. The overlapping and often unclear boundaries result in duplication, waste, obfuscation, delays, poor accountability and outright failures. Any effective fight against globalised financial crime needs to streamline its institutional structures. In the age of globalisation the UK cannot fight financial crime on a shoestring, with puny organisations. Large parts of the patchwork should be replaced by a UK equivalent of the SEC. But a new organisation would not be able to combat wealthy elites or giant corporations without significant resources. This might be expensive, but it is an investment that would pay off. Labour has recently made some headway with its message that there is a cost of living crisis - which has continued despite Osborne's recovery. This feeds a number of other important messages, including that this is a recovery for the rich, and that you're being ripped off - and so the energy price freeze fits into the same narrative. The average non-retired household is today 6.4% worse off since the recession - that was the finding of a report by the Office for National Statistics out earlier this week. It showed that the average household income fell from £37,900 to £32,600, in real terms over the last five years. In fact, the average household is £300 a year worse off than it was in 2002/03. There is therefore a 'lost decade' of stagnation for household incomes. This decline in income triggered entitlement to extra benefits (e.g tax credits) so that benefits rose from providing 7.6% to 12.3% of gross income for the median household. This is fundamentally a redistribution in the cost of living from the employer to the state - as a result of pay freezes and pay caps. So when Labour talks about a structural welfare spending cap (not individual benefit caps which are disgraceful) it is alluding to this phenomenon, and pledging to deal with the structural issues - and advocating the living wage is a part of tackling low pay subsidies like tax credits. The resonance that Labour has had with this line has rattled the Tories. So, in a blatantly politically-driven misanalysis, HM Treasury has produced data that shows compensation for workers has stayed the same, but what they don't see is that employers are paying more in national insurance and pension contributions. The idea that wages have been cut to sustain or even increase profits is, apparently, a myth. "Overall compensation includes not just wages but also the social contributions made by employers, including pension contributions and National Insurance Contributions. Technically-speaking, these are forms of payment, except that because they don’t go straight into your pocket they don’t feel particularly obvious." In fact a less kind interpretation of this Tory spin - still not on the Treasury website - is that because it doesn't goes into your pocket, it's not really payment. So the Tory argument is that pay has gone down (Ed Miliband's cost of living crisis) due to NI contributions going up (all Gordon Brown's fault) and pension contributions going up (your fault for living longer). If that's the case why have the cuts in corporation tax not been passed on to workers then? Because corporation tax has fallen from 33% to 28% under New Labour, and now down to 22%. If we're all actually no worse off why - by official figures - are a million more of us living in poverty? Why are half a million of us using food banks this year? So was this just a political attack to try to blunt Labour's resonant cost of living line? If so, it's another sign of the civil service being used for party political purposes (and not the first time either). But it's an indication that ahead of this year's Autumn Statement, Osborne has only spin to offer. As Margaret Hodge MP, chair of the Commons Public Accounts Committee, recently pointed out, the UK is at bottom of OECD league table when it comes to tax take. Hodge specifically took aim at the government: describing the tax system for corporations and the super-rich as "increasingly voluntary". She said there was a "growing gap between rhetoric and reality" from this government (we've pointed out there are several reasons why you shouldn't take this government seriously on tax justice). And the HMRC's own half-year report should give further cause for concern - highlighting the impact of staff cuts. Their target is to 'clear' 80% of post within 15 working days. They achieved only 77%. This may not seem like much of a failure until you find the reason: "the deployment of teams from post to phone lines during peak periods of customer demand". So how did call handling get on? They answered only 72.7% of calls, far short of their 90% target. If self-employed people, small and medium sized businesses don't get their inquiries, requests and queries answered - and answered satisfactorily - are they more or less likely to comply correctly with their tax obligations? And if the message is sent that the department is under-resourced, will wealthy individuals and big business be more or less likely to attempt to dodge their taxes? It's not just the HMRC's call and post handling that is struggling. Last week it was announced that 1,500 staff in personal taxes and compliance and 480 in debt management are being targeted for a voluntary exit scheme to cut staff costs. These are the staff who collectively bring in billions of pounds of taxes - which fund public services. 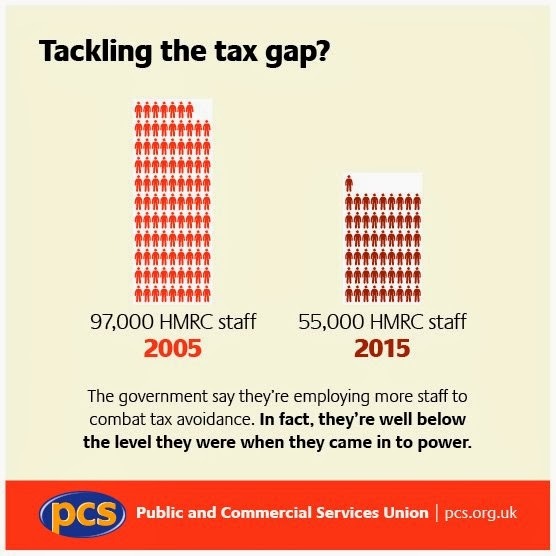 As the PCS graphic shows, HMRC is suffering massive staffing cuts - with the latest tranche announced just this week with 3,000 staff brought in to cover short-staffing in the firing line. Since 2005, 34,000 jobs have gone from HMRC and another 10,000 are planned by 2015 under the government's spending cuts. What's clear is that if we are serious about tax justice, then a big part of that campaign must be to ensure that HMRC has the staff required to take on the £75 billion of tax evasion, £25 billion of tax avoidance and over £20 billion in uncollected taxes. The tax dodging of Amazon, Starbucks, Google, Boots and others has rightly come unders scrutiny. But there also needs to be rigorous scrutiny about the political undermining of our tax revenue collection system. There was a good report out yesterday by the Intergenerational Foundation (IF), which found that 'UK taxpayers provide £5bn annual subsidy for buy-to-let landlords', as the FT headlined its piece. One of the key thrusts of the report is that buy-to-let properties are treated as businesses for tax purposes, although the IF believes they are more comparable to investments. In tax terms, this means buy-to-let landlords can deduct interest on the mortgage of their rented property from taxable rent income. In addition, property owners can deduct 10% from rent received to account for repair and depreciation expenses - without having to provide any evidence of spending on the property. It also found a number of 'loopholes' exploited by landlords, including that if the landlord occupies the property for as little as six months in the 36 months before it is sold, any gains accrued on the property in that period will not be subject to capital gains tax. "It is clear that most of these tax write-offs go to older landlords keen to take advantage of both the lack of housing supply and the demand for properties to rent by the under-35s"
As if the prime issue here is the old exploiting the young! No, no, no. This is an issue of a few wealthy individuals (the report says 4% of the population are landlords, which seems high) exploiting the mass of people who can't afford to buy. The issue is the structures that allow the accumulation of wealth, and further allow those with accumulated wealth to live parasitically from the work of others. This is about wealth, not age (income inequality has a cumulative effect so of course those with wealth are likely to be older). And it's not only an issue for those tenants (young and old) paying ever increasing rents, and increasingly unaffordable rents (especially in London as this website shows). It's an issue for us all as an increasing proportion of tenants are having to be bailed out by housing benefit - as wages have fallen relative to rental prices - and so the welfare state is helping to fund landlords too. In the last two years, 93% of new housing benefit claimants have been from households in which at least one person works. To try to fit this good analysis and report within the IF's intergenerational divide narrative is mistaken and misses the point. (This is not the first time we've taken issue with IF analysis and the National Pensioners' Convention's Dot Gibson responds well to intergenerational divide framing in the Guardian letters page today). The IF rightly argues that landlords' housing is comparable to an investment (and should be taxed as such), but housing is a basic human need. It is not comparable, morally, with other investments like stamp collections, fine art, wine collections, shares or savings accounts. Housing is a human right. Amassing wealth is not. Yet, this government is prepared to cap benefits, not rents. Even if it means homelessness for some - and the indignity of temporary or overcrowded accommodation for many more - in the Tory mind, nothing must interfere with landlords' inalienable right to own as many properties as they like and leech off of the hard-working tenants and taxpayers. The IF's policy proposals are good (p.37 of the report) but could go further: why not limit the number of homes an individual can own? Why not restore the right of councils to control rents (which they had until 1989) to protect tenants? Why not introduce a Land Value Tax so that disused property is brought into use, and to fund new council build? Or why not introduce a Wealth Tax (as advocated here by Greg Philo here) or greater inheritance tax? And why not, perhaps least radically of all, ensure a much more progressive system of general taxation to restrict the accumulation of excess wealth in the first place? Until we challenge the right of a few to accumulate excessive wealth, we will never end exploitation in either the housing market or the labour market. 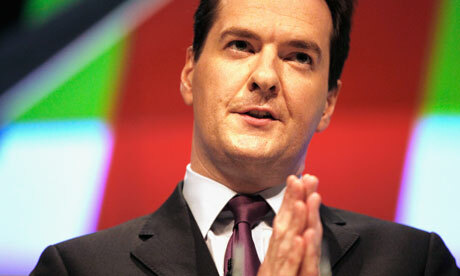 Should Osborne be praying for the economy to stall? After three quarters of economic growth, George Osborne has already transitioned from cautious optimism to full-on self congratulation. "The UK has been singled out as an example of the improvement and there is recognition that we have stuck to our economic plan", he said last month. Let's leave aside that he hasn't stuck to his plan at all (the deficit was forecast in 2010 to be far lower today than it is, and as a result of two flatlining years he is borrowing over £200 billion more than planned). Let's even underplay that even today's public debt figures £8.1 billion this October, down from £8.2 billion for October last year, are hardly impressive. 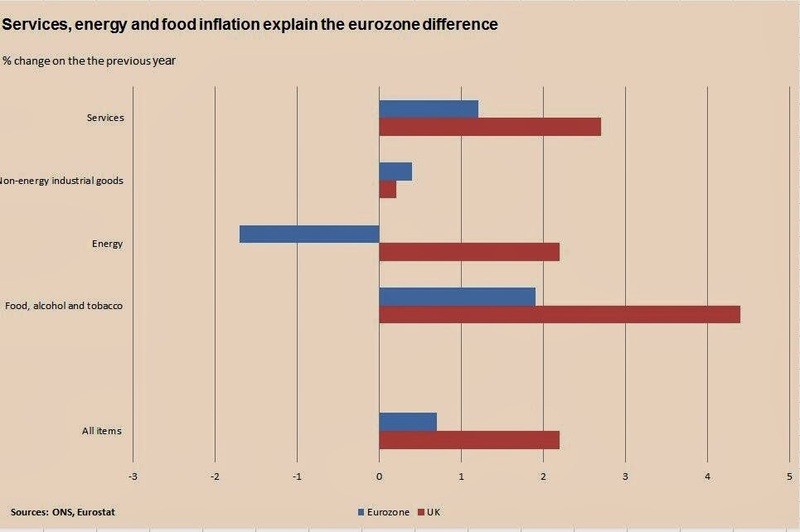 the UK is in "sustained recovery". Three consecutive quarters of reasonable growth (by historical standards) is fairly hard to dismiss. What economists now disagree about is not whether recovery has been sustained, but whether it is sustainable. The question therefore is can growth continue with debt at high levels and real incomes declining? The unstable retail sales figures - with October registering a fall that confounded predictions - are a warning sign to the optimists. So the question is whether the recovery will stall - due to people reining in their spending without any compensating surge in government or corporate investment - or will it continue to grow as people take on ever greater debts? If the latter is the case, then the ultimate result may be a sharp crash, caused by unsustainable levels of debt. That scenario should make George Osborne pray for the economy to stall (while he devises a sustainable growth strategy - something some of his opponents have been advocating and outlining since 2010). Last week we reported on the great unemployment disappearing act, focusing on growing divergence between the claimant count and the ILO measure of unemployment (see graph). But this growing disparity isn't uniform across the UK. 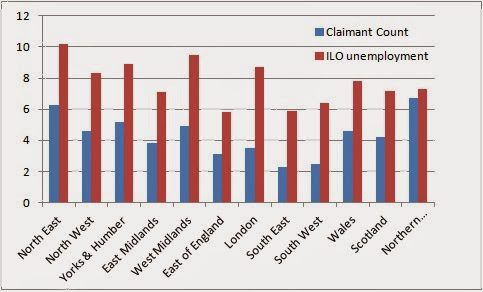 As the chart below shows, there is a massive regional disparity between the claimant count and ILO unemployment in some UK regions, but a close correlation in others. Our 13 November analysis highlighted the growing divergence between the two unemployment measures (showing that in 1993 the claimant count was 96% of ILO unemployment, but today is only 53%. Health warning: the figures used are from the latest ONS Labour Market Survey stats, which for claimant count are October figures and for ILO measure are July-September. However, this difference in monthly accounting does not explain the sharp differences either within or between regions. However, across the UK there are massive disparities. So why is it that in London and the South if you're unemployed you are far less likely to claim jobseeker's allowance than if you're in the North East or Northern Ireland? And why does jobseeker's allowance reach so many more of the unemployed than everywhere else in the UK? UPDATE (21/11/13): As was pointed out by Labour market stats wonk, Paul Bivand, Northern Ireland has some devolved powers over social security - and the UK sanctions data (analysed here) doesn't include Northern Ireland. So is that the answer - is it due to a less stringent sanctions regime there? The Socialist Register was founded by Ralph Miliband and John Saville in 1964 as ‘an annual survey of movements and ideas’ from the standpoint of the independent new left. It is currently edited by Leo Panitch, Greg Albo and Vivek Chibber, assisted by an editorial collective of eminent scholars in Africa, Asia, Europe and the Americas. Each volume is focused on a topical theme and characterized by the inclusion of relatively long, sustained analyses which cut across intellectual disciplines and geographical boundaries. The 50th volume of the Socialist Register is dedicated to the theme of 'registering class' in light of the spread and deepening of capitalist social relations around the globe. Today's economic crisis has been deployed to extend the class struggle from above while many resistances have been explicitly cast in terms of class struggles from below. This volume addresses how capitalist classes are reorganizing as well as the structure and composition of working classes in the 21st century. An event jointly organised by Action Aid, Christian Aid, Oxfam, Tax Justice Network, War on Want. With a great line up of speakers and panellists this promises to be a day that will make you think seriously about tax justice. This past year has seen a momentous shift in public and political perception of the issue of tax fairness. "Individuals and businesses must pay their fair share" David Cameron in his speech to the World Economic Forum in Davos in January this year. Having already had huge tranches of public money shifted from public goods and services to bail out banks guilty of reckless lending; people have witnessed exposé after exposé of large multinationals and wealthy individuals refusing to pay back into the common weal and scorning their basic civic duty to pay a fair share of tax. People across the globe find themselves trapped in poverty while rich multinationals and individuals get away with not paying what they owe. People are angry - it’s time to build on this anger. 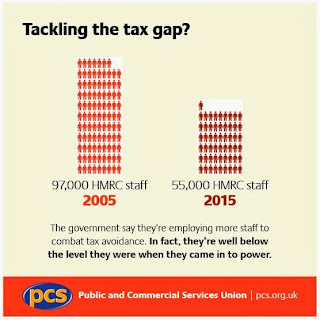 In the past month a number of organisations and individuals have been discussing how we can convert the peaks of media and public outrage at tax avoidance into a strong, grassroots and citizen-led movement call for tax justice that this and future Governments cannot ignore. This event is an opportunity to join with other organisations, activists and thinkers, to hear from tax justice pioneers and critics, and to ask the hard questions and debate the tough issues. Join us for the Tax dodging ‘Tax Justice – Are you serious?’ forum. If you intend to join us for the UK Gold screening & panel discussion at 6.30 please do confirm your tickets for the film here. Mervyn King backs the tax justice campaign? Today's unemployment figures revealed that the internationally recognised measure of UK unemployment fell by 48,000 and the claimant count (i.e. the number of people claiming jobseeker's allowance) fell by 41,700. These two figures were remarkably close. To the uninitiated naively logical this might seem to corroborate that there are roughly 40-50,000 fewer unemployed people in the last 3 months. However, with those subtractions ILO unemployment stood at 2.47 million, while the claimant count was only 1.31 million. So in relative terms the fall in the claimant count was nearly twice as sharp. 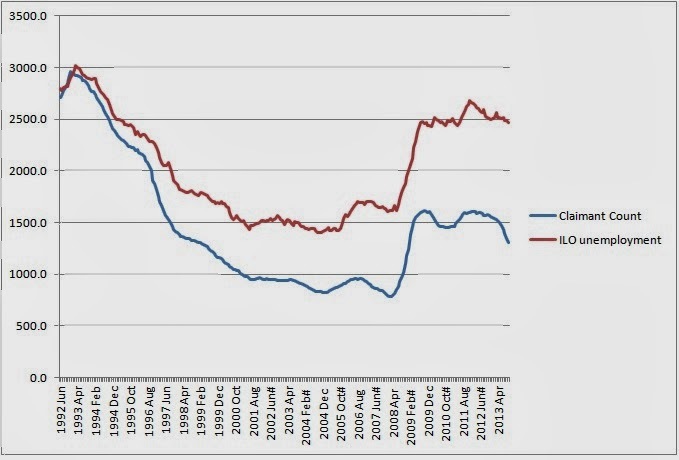 As the graph below shows - this is not a one-off occurence but part of a 20-year trend that has seen the ILO unemployment measure part company with claimant count. Whereas the claimant count accounted for 96.6% of ILO unemployment 20 years ago in 1993, three years later the claimant count was only 83.2%. Five years on again - or twelve years ago - in 2001, the claimant count was just 64.5%. Today, the claimant count was just under 53% of the ILO measure. It is not entirely clear why this has happened. Certainly a part of the reason is the increased conditionality, and reduced eligibility that has applied to claiming unemployment benefit since the 1995 Jobseekers Act - and toughened by successive welfare reform acts under successive governments. The recent sharp downturn in the claimant count - and sharp relative to ILO unemployment - is no doubt partially explained by the increase in sanctions (see LEAP analysis 6 November 2013). But the rut set in slightly earlier. Under the Major government the claimant count averaged 93.3% of the ILO measure. In the Blair/Brown New Labour years, the claimant count averaged just 63.1%, and under Cameron's coalition government to date that has already dropped again to 59.9% (and was 53% in today's figures). It means that the claimant count is becoming a less reliable indicator of true unemployment. With an increased sanctions regime, and extra conditionality generally (including workfare), and the demonisation of claimants as 'scroungers' and 'skivers', jobseeker's allowance has become a daunting benefit to claim. As PCS research has found (see infographic here) the real value of unemployment benefit has fallen from 18% of average wages in 1990 to just 13% today. With increasingly greater sanctions, more conditionality, less eligibility, more stigma and less value - is it any wonder the claimant count now represents barely half the true level of unemployment. The thatcherite Help-to-Buy scheme will explode into another housing crisis if "soaring" demand is not matched by building, surveyors told the government yesterday. Home sales are at their highest in over five years, according to monthly research by the the Royal Institution of Chartered Surveyors (RICS). But its members also reported the sharpest increase in house prices since June 2002 - sparking fears over a new housing bubble. Help to Buy's first phase offered a 15 per cent mortgage guarantee on new-build homes when it was launched in April. That was extended to existing housing stock last month and over 2,000 people have since taken advantage. Some were used as props at a Downing Street press conference yesterday as David Cameron hailed the scheme's success. He boasted: "This is all about helping hardworking people get on the first rung of the property ladder - and helping them get on in life." But RICS chief economist Simon Rubinsohn called for the government to "urgently" address the imbalance between supply and demand. "Housebuilding starts have picked up recently but we are still well behind in terms of the amount of properties needed," he reminded Mr Cameron. Part-nationalised banks RBS and Lloyds, along with HSBC, have signed up to offer 95 per cent mortgages as a result of the scheme. The Left Economics Advisory Panel pointed out that it was a huge gamble to increase personal debt when wages are stagnant and jobs are at risk. Co-ordinator Andrew Fisher said: "If the dangers of rising house prices, greater borrowing and suppressed incomes sound familiar, then that is because it was this combination that in large part contributed to the 2008 crash. "Unless accompanied by a massive programme of housebuilding, Help to Buy will continue inflate house prices - making home ownership even more unaffordable for most families - and lead to another crash." Mr Fisher added that the scheme could land taxpayers with huge liabilities if people default on loans as a result of austerity. DWP sanctions data published today revealed benefit sanctions are robbing £328,767 from unemployed people every day - based on the new sanctions regime imposed since October 2012. If you're thinking well, that's fair enough, they can't have been looking for work then I can only point you in the direction of the excellent report by Manchester Citizens Advice Bureau on people's real experience of being sanctioned. If you don't have the time to read that report, then I'll appeal to your logic. The data shows that sanctions have increased by 137% compared with figures for between 2000-2010. Have claimants suddenly become so much worse? In the last two and a half years, the number of unemployed people sanctioned has averaged 64,307 a month, compared with 27,108 a month between 2000 and 2010. N.B. And even the above may be a severe underestimate, due to sanctions decisions being deferred in 120,000 cases due to the 'Poundland case'. In cash terms, the figures are even more stark: in 2009/10, £11 million of jobseeker's allowance (JSA) benefits were sanctioned, but in first six months of 2012/13 alone it was £60 million. This is because not only are more people being sanctioned, but more of their benefits are being removed - and for a longer period. The stats since October 2012 (when the new sanctions regime was introduced) show over 52,000 people have lost their benefits for 3 months or more. "The government’s perverse and punitive approach is a collective punishment on the unemployed and the disabled for its own failure to create sufficient jobs." Over 4,300 lone parents have been sanctioned every month under new sanctions regime - and 230 a month have received high level sanctions involving loss of benefits for 3 months or more. The effect of this on children will be appalling - and surely constitutes cruel and unusual punishment, by reducing to abject poverty the children of those who have (supposedly) breached the rules. In nearly a third of cases (31%) under the new rules, the sanction was directly related to failure to participate in the Work Programme, mandatory work activity or some other scheme. Given international research and Work Programme figures show the abject uselessness of these schemes in assisting in securing paid work, this is being sanctioned for avoiding doing something counterproductive. For disabled people on employment and support allowance, sanctions have increased by 156% in the last year. These sharp increases highlight how the use of sanctions has been cranked up as part of the coalition's drive to reduce the deficit on the backs of the poor, while slashing corporation tax and the top rate of tax for the richest 1%. The JSA data also shows non-white claimants are slightly more likely to get an adverse decision than white claimants. 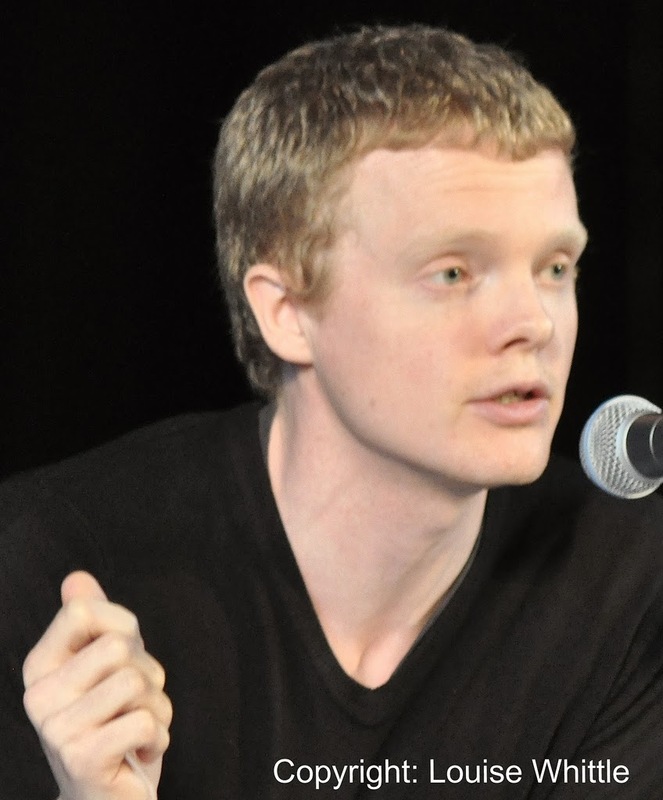 For all three categories of sanctions, non-white claimants got a higher proportion of adverse decisions: for low level, white claimants 56%, but for non-white 60%; for intermediate level white claimants 81% compared with 83% for non-white; and for high level sanctions (losing benefits for 3 months or more) white claimants referred for sanctions had adverse decisions 33% of the time, compared with 38% for non-white claimants. Although the differences are marginal, they are consistent across all three sanction levels. Likewise for young people, while 16-17 year olds were sanctioned 64% of the time (after being referred for sanctions), for those over 55 it was 48%, and there was a direct correlation through the age brackets: the younger the claimant the more likely to be sanctioned. This is even worse given that young people inexplicably receive a lower rate of JSA (£56 per week compared with £71). These data beg the question about whether the policy was subject to equality impact assessment - and if so whether this was predicted? (any insights welcome). Remember, "It wouldn't be happening without the Liberal Democrats"
"Britain is on its way back. We need to stick to our plans to make sure this is a recovery that is built to last. That is the only way to improve living standards. "Our economy is growing because of the hard work of people and businesses throughout Britain. But the coalition's economic plan is the rock on which our recovery is being built - so it wouldn't be happening without the Liberal Democrats." On almost every count, he is wrong. This 'recovery' is doing nothing for living standards, which continue to fall. 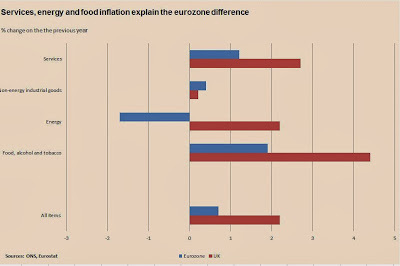 Wages are rising at just 0.7%, while inflation is four times that at 3.2% (RPI, 2.7% CPI). For people on out of work benefits (and indeed those on low pay whose incomes are topped up by tax credits) benefit increases were capped by this government at 1%. Put that alongside rents rising way above wage increases, energy prices rising at 8-9%, and the forthcoming 6% rail fare increase in January - and you can see the problem isn't being resolved soon. Figures show that workers have collectively lost £50 billion a year in real terms cuts in pay. So when Danny Alexander says that this 'recovery' is the only way to improve living standards, it is an evidence-free assertion, a delusion and, since he probably knows this, a flat-out lie. Of course living standards are improving for some people: the 1000 richest Britons increased their wealth by £35 billion last year (if you wanted to know where your missing pay rise ended up). So where has the recovery come from? Mostly, debt. Consumer and mortgage debt to be precise. Yes, exactly what caused the crash, an unsustainable credit bubble. George Osborne (Danny Alexander's boss at HM Treasury) is huffing and puffing into that bubble with his Help to Buy scheme - re-introducing 95% mortgages at a time of rising house prices and falling wages ... what could possibly go wrong? The "rock on which our recovery [sic] is being built" is that least rock-like of entities, a bubble. The question for the government is whether that bubble will burst before or after the 2015 election ... they may hope after, but the longer it inflates, the worse it will burst. Alexander is right about one thing: "it wouldn't be happening without the Liberal Democrats", it's just that the "it" he refers to is rising poverty, homelessness, inequality, and a credit bubble that could spell further disaster for the UK economy and his government. Remember, "it wouldn't be happening without the Liberal Democrats." What are the chances that in the face of public criticisms, big business would curb its tax avoidance practices? Well, not much, as evidenced by a case decided by the US Court of Federal Claims. Salem Financial Inc v United States relates to a complex financial transactions known as STARS (Structured Trust Advantaged Repackaged Securities). The case involved Salem Inc, a subsidiary of North Carolina based bank, BB&T. The scheme was designed by Barclays Bank, a major UK financial institution; KPMG, one of the world’s biggest accountancy firms; and Sidley Austin, a US law firm. At the centre of the dispute is a tax liability of some US$660m. Through collaboration with Barclays, KPMG specialised in developing transactions that took advantage of differences between international tax systems. Barclays marketed some versions of STARS to a number of corporations, including AIG, Microsoft, Intel, and Prudential. KPMG introduced the STARS transaction to BB&T at a January 17, 2002 meeting and used a slide show to outline the steps necessary for the scheme to work. KPMG had little prior business relationship with BB&T. The key idea of the tax avoidance scheme was to generate large-scale foreign tax credits which could in turn be used to enhance revenue and reduce taxes payable by BB&T in the US. A series of transactions with circular cash flows were designed to create the tax savings. The court noted that in essence the scheme called for BB&T to establish a trust containing approximately US$6 billion in revenue-producing bank assets. The monthly revenue from the trust was then cycled through a UK trustee, an act that served as a basis for UK taxation. Although the revenue was immediately returned to BB&T’s trust, the assessment of UK taxes generated tax credits that were shared 50/50 between Barclays and BB&T. A US$1.5 billion loan from Barclays to BB&T was also part of the structured transaction, although the loan was not necessary to the objective of generating foreign tax credits. The Barclays monthly payment to BB&T represented BB&T’s share of the tax credits, and had the effect of reducing the interest cost of BB&T’s loan. The main question for the 21-day court hearing was whether the STARS transaction had any purpose other than to generate tax savings, and if not, whether penalties should be assessed against BB&T. The 67-page court judgment found in favour of the government and the company has been ordered to pay US$680 million plus penalties of US$112 million. After examining some 1,250 exhibits the judge referred to the scheme as “an abusive tax avoidance scheme” and said that the “conduct of those persons from BB&T, Barclays, KPMG, and the Sidley Austin law firm who were involved in this and other transactions was nothing short of reprehensible”. The judge went on: “The professionals involved should have known better than to follow the STARS path, rife with its conflicts of interest, questionable pro forma legal and accounting opinions, and a taxpayer with a seemingly insatiable appetite for tax avoidance”. The whole STARS set-up was described as “a sham structure”. Barclays and KPMG are no strangers to tax avoidance controversies. After lengthy investigations by the US Senate Permanent Subcommittee on Investigations and action by the US Department of Justice, KPMG were fined US$456 million for “criminal wrongdoing” in tax matters and a number of its former personnel were also given prison sentences. The firm has also been the subject of investigation of the UK House of Commons Public Accounts Committee, but this has not dulled its appetite for profits through the sale of tax avoidance schemes. Barclays relies upon taxpayer guarantees for its core business, but operates a very lucrative tax avoidance business which is estimated to have generated around a billion pounds in fees each year between 2007 and 2010. Last year the UK government had to introduce emergency legislation to negate two avoidance schemes used by Barclays for its own business which could have deprived the UK Treasury of around £500 million. Despite fines and prison sentences major businesses remain addicted to tax avoidance. Public opprobrium has become just another cost of doing business. It is time to shut down businesses who routinely pick citizens’ pockets through tax avoidance. Their schemes are undermining revenues that are much needed to revive the economy and provide education, healthcare, pensions, security and other public goods that distinguish civilised societies from the rest. Yet the UK government continues to shower gifts on tax avoiders, KPMG continues to receive public contracts and Barclays is propped up by taxpayer-funded guarantees and loans. 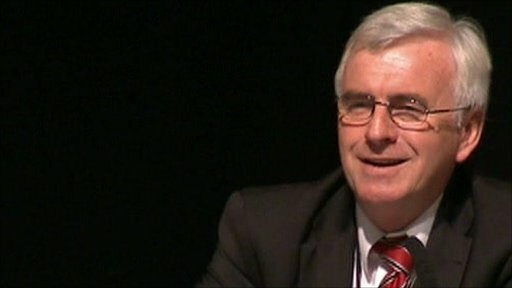 Only this week Ed Miliband hired KPMG’s deputy chairman for advice on low pay. Rather than giving them another consultancy job, politicians should be asking KPMG to explain the firm’s role in the erosion of social fabric. Since Ed Miliband became leader, the strategy of the left has been to make issues safe for him by building support within and outside the party issue by issue. Only when it's safe is he confident about moving on an issue. Today's speech demonstrated that we are setting the agenda but there's so much further to go. A major housebuilding programme is needed, but it needs to be public housing alongside rent controls to stop landlords profiteering from housing benefits. Challenging the scapegoating of unemployed and disabled people needs to be made a reality by scrapping the rigged capability tests associated with Atos and abolishing workfare. Time limited price controls won't end the rip-offs. A clear commitment to end privatisation is needed, especially in the NHS, and to bring rail, water and energy back into public ownership plus, if it goes ahead, Royal Mail. To tackle low pay, we need to make the minimum wage a living wage by right, re-establish trade union rights and restore a commitment to full employment. People already suspect this is a recovery for the rich and ongoing recession for the rest. This is exactly the time when people want more radical action. Make today's speech a beginning. MINISTERS began reprivatising Lloyds yesterday, flogging off a £3.2 billion stake in the once failing bank. Chancellor George Osborne hailed the sell-off as evidence that Britain was “turning the corner,” but economists raised concerns that the banking sector was merely returning to the light-touch approach central to the severity of the financial crisis in the first place. Investors snapped up the stock at 75p a share – just above the 73.6p average the Treasury paid in the £20.5bn bailout the bank at the height of the financial crisis. The taxpayer’s stake has been reduced from 38.7 per cent to 32.7 per cent, with no further sales for at least 90 days. Mr Osborne said the sale eased the national debt by £586 million, based on a paper valuation of the shares on government books, though that figure is subject to Office for National Statistics approval. But left economists warned that the fire sale would be bad for Britain in the long term. Left Economics Advisory Panel co-ordinator Andrew Fisher said: “Lloyds was bailed out by the state, and propped up with public money. “Now Lloyds has returned to profit, rather than maintaining a long-term income stream, it is being sold off for private profit. “It’s a drive by the government to bail out the most failing aspects of the private sector – that of light-touch regulation in the financial sector, while imposing austerity cuts for the rest of society. Big business is policing tax avoidance – what could possibly go wrong? The privatisation of Royal Mail is making headlines, but another form of privatisation is attracting less attention – of UK law enforcement in vital areas, such as organised tax avoidance. Now it is business interests that decide whether Her Majesty's Revenue and Customs (HMRC) can go after those involved in abusive tax avoidance schemes, and this includes those who are close to the tax avoidance industry. The flaws in the privatisation of law enforcement have been highlighted by the resignation of David Heaton from the government's flagship general anti-abuse rule (Gaar) panel. The panel is supposed to tackle tax abuses but Heaton was freely giving tips for dodging taxes. Heaton is a partner in accountancy firm Baker Tilly and is also a recent chair of the Tax Faculty at the Institute of Chartered Accountants in England and Wales. Baker Tilly is no stranger to tax controversies as the firm's revenues are dependent on novel interpretations of tax laws. In January 2011, the UK government raised VAT from 17.5% to 20% and the firm urged companies to do their billing in advance and thus avoid the hike. In recent years, Baker Tilly has expanded its revenue-earning capacity by absorbing organisations chastised for designing aggressive tax-avoidance schemes. The Gaar legislation came into effect on 1 July 2013 and is part of a trend of giving business a key role in law enforcement. Originally, it was intended to enable HMRC to challenge "aggressive" tax avoidance, but was soon diluted to focus only on the most abusive forms of tax avoidance. The flaws were noted by Lord MacGregor, chair of the House of Lords economic affairs sub-committee on the finance bill, who said that: "There is a misconception that Gaar will mean the likes of Starbucks and Amazon will be slapped with massive tax bills. This is wrong and the government needs to explain that to the public. Gaar is narrowly defined and will only impact on the most abusive of tax avoidance". The Gaar legislation contains a "double reasonableness" test and requires HMRC to show that the tax avoidance schemes under scrutiny "cannot [reasonably] be regarded as a reasonable course of action". An avoidance scheme will be treated as abusive only if it would not be reasonable to hold such a view. So, if a dubious practice is widespread and established then it may well be considered to be reasonable. HMRC is further shackled in that it can't easily go to the courts to enforce Gaar because it needs permission from a panel of experts on whether the arrangements in question constitute a reasonable course of action. The panel members are unpaid and this inevitably favours businesses that can bear the cost of seconding staff. In addition to Heaton, other members of the panel are Patrick Mears (chair), a senior tax partner at law firm Allen and Overy; Michael Hardwick, a consultant at law firm Linklaters; Brian Jackson, vice-president for group tax at Burberry group plc and previously tax partner at KPMG; Sue Laing, a partner at law firm Boodle Hatfield; Gary Shiels, a business consultant; and Bob Wheatcroft, a partner in accountancy firm Armstrong Watson. There is no representation from NGOs and others who routinely expose tax avoidance. If matters reach a court, then judges need to take into account the opinion of the Gaar advisory panel given to the HMRC. The legislation says little about the public accountability of the panel. George Osborne courted public opinion by saying that he found tax avoidance/evasion "morally repugnant", but the government's sense of morality is to appoint foxes to guard the henhouse. No doubt, members of the Gaar panel are devoted to serving the public interest, but their conception of the public interest is likely to be informed by their business and professional interests, especially as their profits and bonuses are dependent on serving clients. So who is safeguarding the interests of the ordinary people? Neoliberals would defend the current arrangements by arguing that government needs people who know the practices and are thus best suited to be the guards. If that logic had any substance then those falling on hard times or suffering because of the bedroom tax should be deciding who can reasonably be prosecuted for, say, benefit fraud. But that is not the case. The government has mobilised the full might of the state to tackle benefit fraud estimated to be around £1.9bn a year, but the same does not apply to tax avoidance/evasion running at between £35bn and £100bn a year.